Shelley from Nahia Creations is no stranger to the Soap Queen (here, here), having been an avid reader and commenter from this blogs early days. 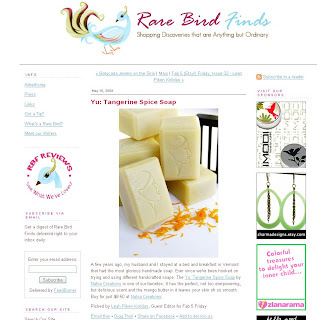 Check out the major shout-out she got from Rare Bird Finds. We certainly have an A-List Community around here. And, I’m feeling pretty good about my soap choices right now too – I have a bar of Chocolate Espresso Nahia Creations soap in my shower right now. Hint: You can buy your own Chocolate Espresso fragrance right here. Congrats Shelley! You deserve the recognition; your soap & packaging are amazing! Previous Post: Why Does Your Soap Cost So Much? Next Post: Why Use a Custom Photo? yay, Shelley!! Love her soaps!